You’ve stated that “fashion is not art.” What, then, are your thoughts about fashion? The most important element of fashion is how we use it to expressing who we are and to show how we feel. Fashion is actually one of humanities biggest communication tools. It represents who you are and many people underestimate this fact when designing clothes. When I was growing up my mother was a professional nurse. It was on a part-time basis and during her free hours she used to design clothes with my aunt. I grew up in a family that was very fashion conscious. That’s where I got firsthand experience on developing a personal style and getting a feel for fashion. Explain how you go about your designs. Where do you get your inspiration from? 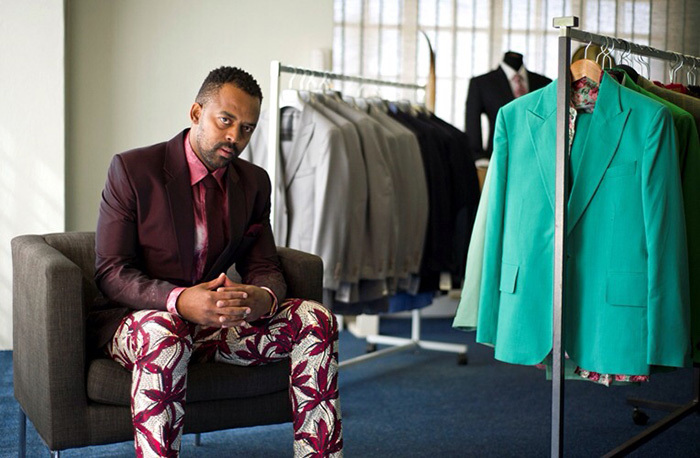 I lean more towards the bespoke, tailoring side of the fashion business. I trained in London, which still has a large influence on me. I like classic with a twist. I’m also inspired by tailoring but with a conceptual, fresh approach, not reinventing the wheel, just making it better. The world is changing and technology is changing fast. Similarly, I believe there are certain elements of fashion that need to change too. It’s in this realm that I try and develop a fresh approach. I’m inspired by God’s handwork too. The stripe on a Zebra’s back, the petal on a flower, the scales of a fish or the texture of a pomegranate. Colour is all around us in Africa too. Inspiration can come from anywhere. It can be anything from a guy walking in the street, to sitting quietly at home or how people interpret style in the townships. People in shopping mall’s dress in amazing ways, expressing how they feel and their relationship with their clothes. My latest collection has been influenced by the Ndebele culture. At the House of Olé we draw a lot of inspiration from the continent and believe the rest of Africa is very colorful and vibrant. There’s a lot going on in Africa. What type of person do you design for? I think most importantly, someone that appreciates bespoke, made-to-measure clothing. If you don’t understand that concept, then most likely the first suit you buy will be your last. While my role as a designer is to make people look good, it’s also up to someone to understand that clothing can help express your personality. It’s a two-way relationship. Why do people buy and wear your clothing? I think most people see others wearing our suits and they recognise the House of Olé signature and brand. Our cut and approach to fashion makes our clothing instantly recognizable. We try and achieve a look that boasts sharp tailoring, but without any fear of using color and texture. Where do you see House of Olé going in the future? We have plans for entering the retail market fully next year. We’ve also just launched our first shoe collection. Beyond retail, there’s a big gap in terms of educating and developing new talent. There’s not a lot of tailoring knowledge around so I feel the need to pass it on. Any plans to expand beyond South Africa? We have clients in Botswana, Namibia, Angola and London. The brand is growing nicely and we’ve made our mark, but we still have a long way to go, despite having been in business for 14 years now. I think word of mouth is one of the most powerful marketing tools around. That’s why if you visit us at House of Olé we make sure everything is of the highest standard. Another powerful platform is South Africa Fashion Week. It creates a big platform for designers to showcase their collections and has been one of the most important aspects of my designing career.